Last year we had a disastrous start to the year, and our first meeting of 2013 ended up being a virtual meet up after Bolton received a foot of snow. 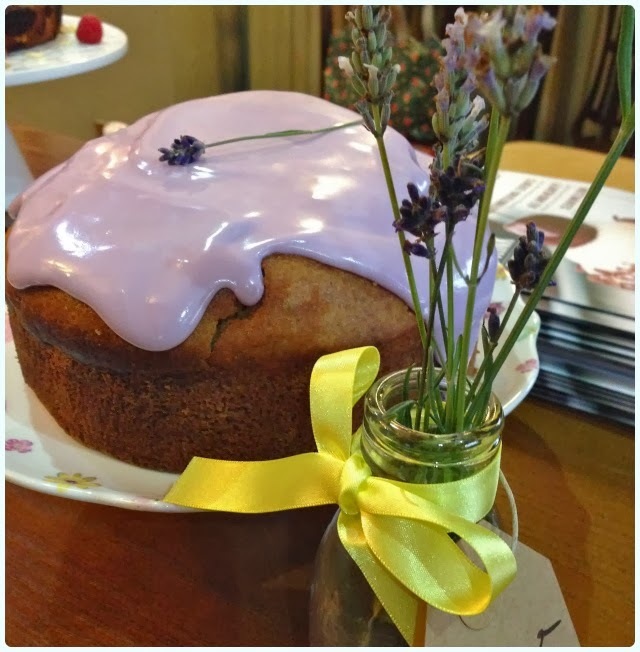 I think about five of us managed to trek to our beloved Thyme Deli, whilst Corinne, Michelle and Mo had a mini meet in Farnworth, and Bev sent pics of her beautiful cake via Facebook. No such dramas this year, although there was a horrible date mix up with the venue, which luckily was sorted out toot sweet by their manager - phew! 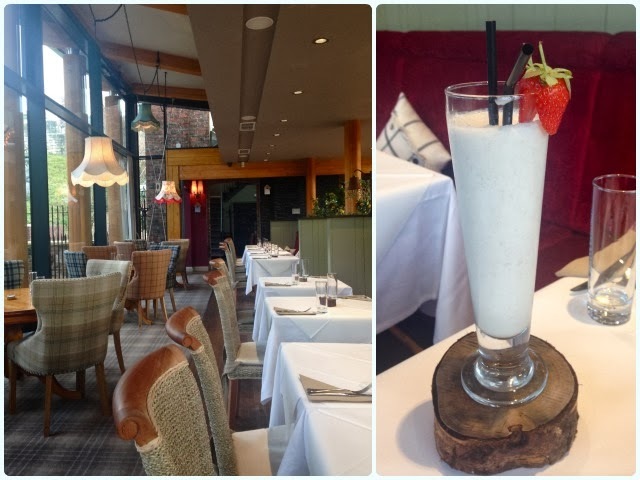 We were at one of our favourite locations, The Rivington in Blackrod. This month's meeting was inspired by the Shane Meadows film/The Clash song, This is England. 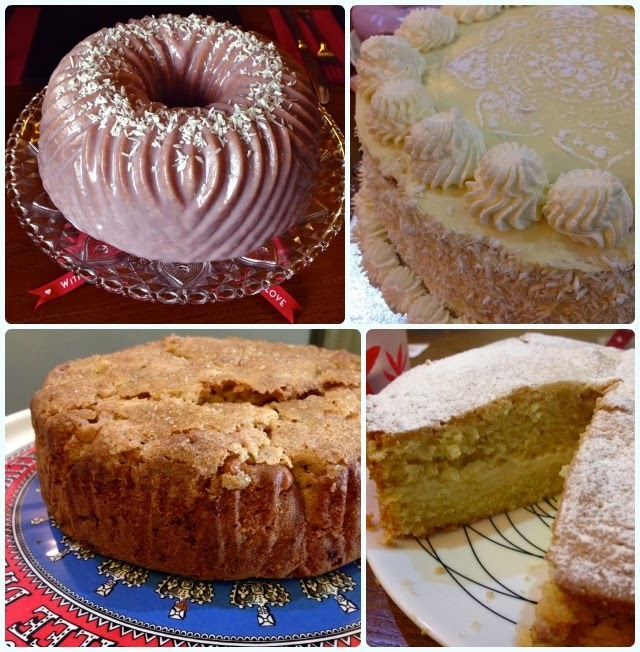 We are a nation of bakers, each region with its own speciality and slight variations on common themes. This country has spawned some excellent practitioners too, ranging from the mother of the cookbook Mrs Beeton, to our modern day heroines like Delia and Mary Berry. 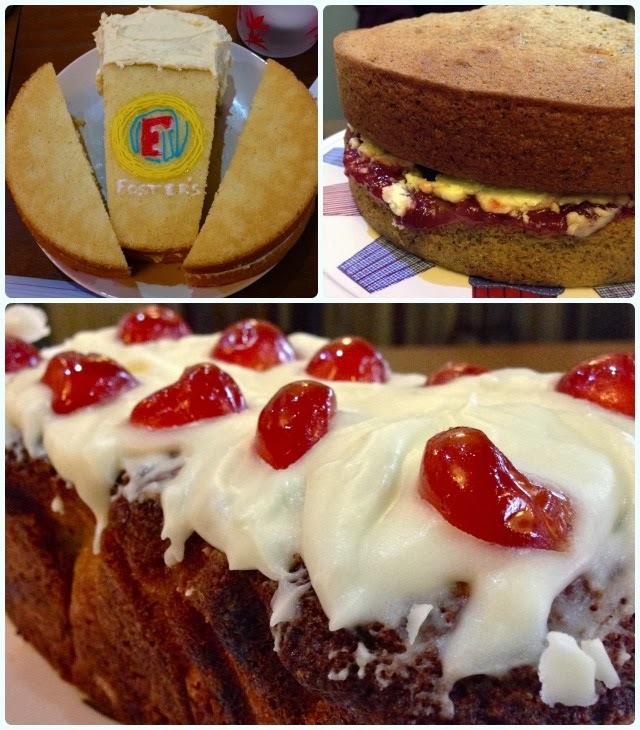 We bloody love a good cake. We had a lovely intimate gathering where we met some new friends, and were reacquainted with some old ones too. Details of our next meeting, Two. 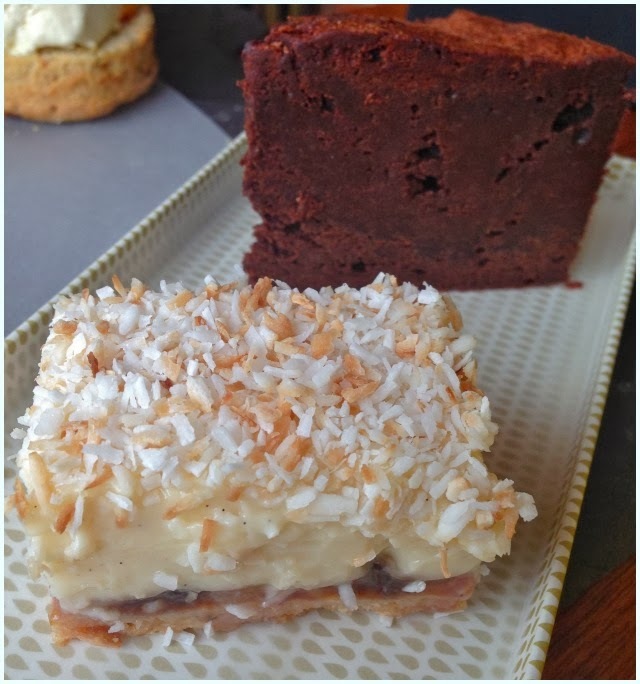 Since then I have enjoyed reading about the history of our favourite baked goods, and love to incorporate these little snippets into my own baking. In the last season of the Bake Off, they went to see the Tottenham Quakers. They had historically made this striking sponge traybake using the juice of mulberries from their garden to make the pretty pink icing. 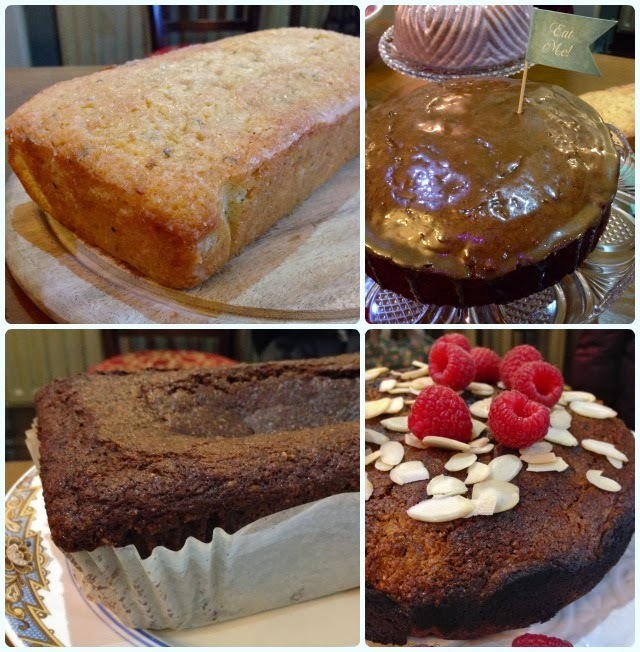 Quakers would often bake for each other, and share cake at meetings. 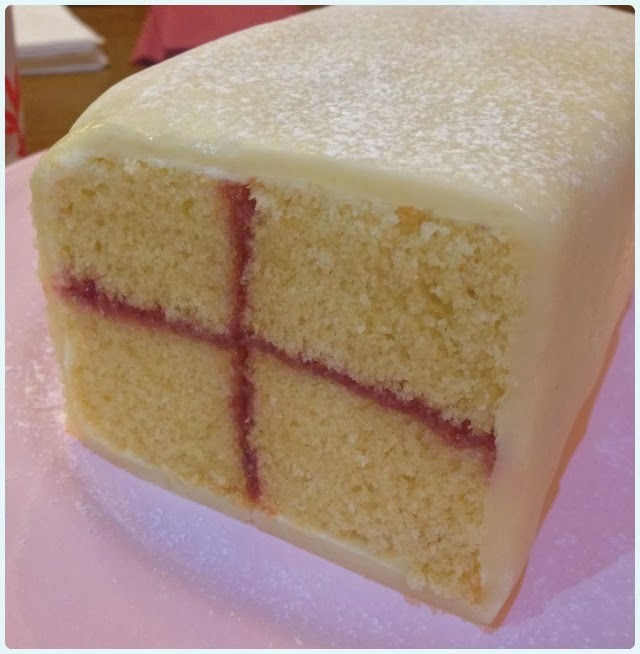 They lady making the one on the Bake Off said it was an ideal cake because it was 'easily cut up and distributed amongst a large group of people'. 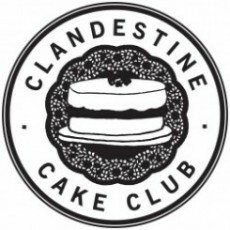 This struck a chord: group of people, easily cut up to share... Bundt and cake club sprang to mind! 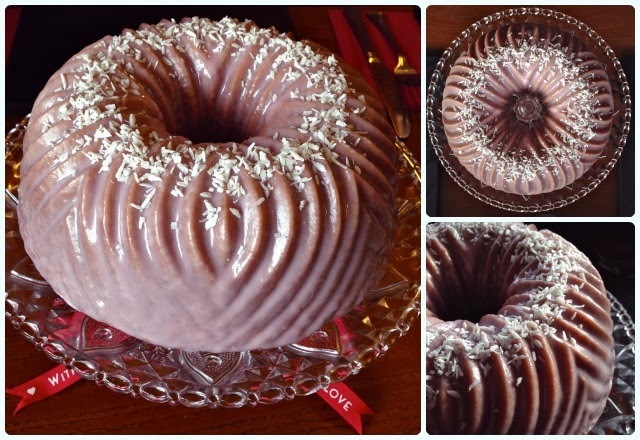 My bundt version shared all the original characteristics; pink icing, vanilla sponge and easily shared, although mine looks very different to theirs! I used my Nordic Ware Bavaria Bundt tin to get such a beautiful pattern. Grease and flour a regular sized bundt tin using cake release spray - 2.4l, 10 cup, 10 inch. Sift in a third of the flour mix followed by half the yogurt. Repeat this until everything is combined. Don't over mix or it'll be as rubbery as a pair of wellies. 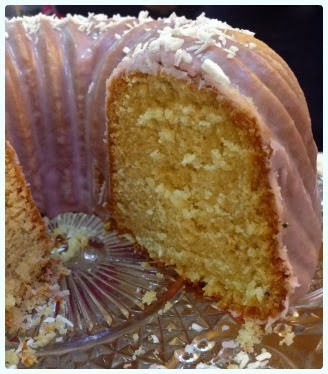 Mix the icing sugar with a little mulberry juice until it's a runny consistency. Tip it over the cake in whichever cack-handed fashion suits you best. It will naturally run to cover the cake. Snippet from the Bake Off. Things sure have changed since my last visit to the Victoria and Albert Marriott in Manchester. Don't get me wrong, we had a pleasant experience last time, but I had suggested a few areas for improvement. Just before Christmas, they got in contact and asked me to come back to sample their new menu. Perched on the banks of the River Irwell, there's something distinctly industrial about the setting for this afternoon tea, and I think their new offering reflects this urban feel. With so much competition in the city centre, a large hotel like the Marriott really needs something unique in order to pull in the crowds. That they have done. We sat by the window watching numerous knackered rowers and the odd cyclist concentrating hard on not falling into the drink! My husband is a long suffering type. He's not really a fan of afternoon tea, and doesn't really share the same sweet tooth that is my affliction. 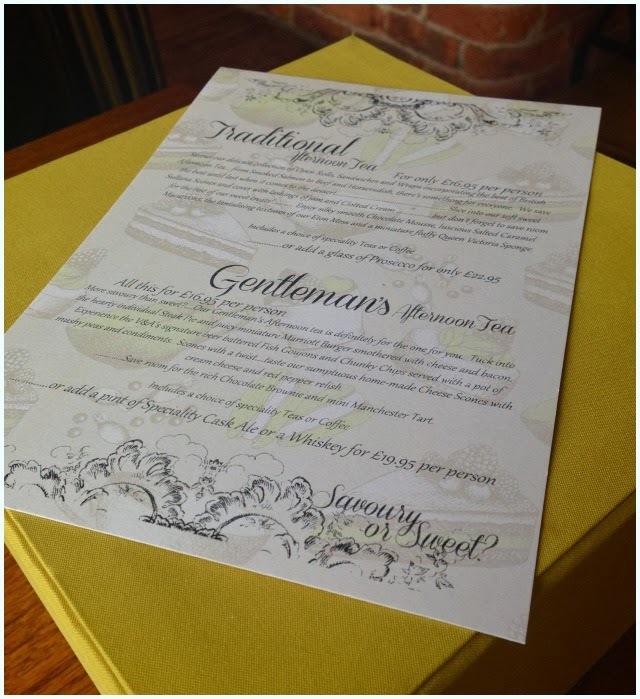 Imagine our excitement when we found out that the Marriott were offering a gentleman's afternoon tea? 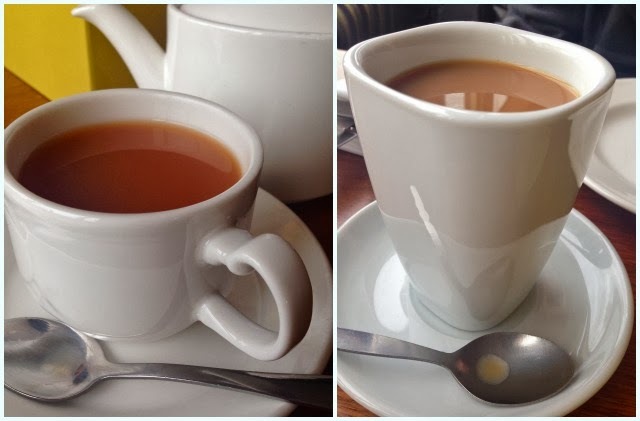 We were offered hot drinks, and settled on a nice English breakfast tea and an Americano whilst we perused the menu. 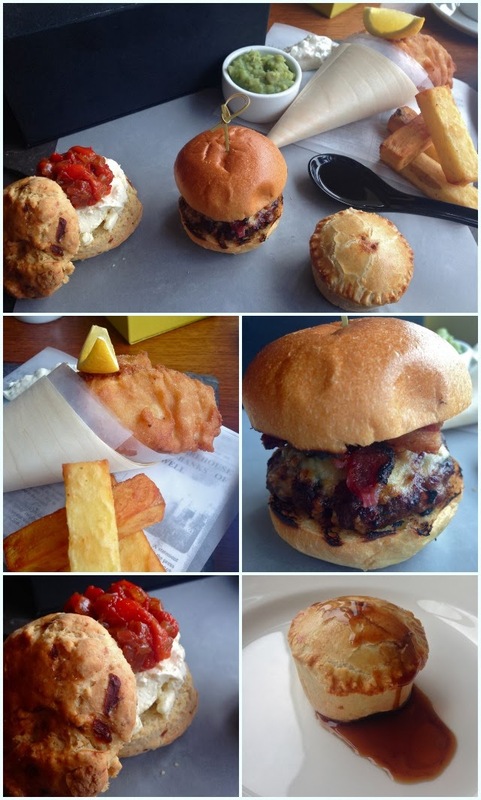 Gentleman's afternoon tea - mini Marriott burger, individual steak pie, fish goujons with chunky chips, cheese scone with cream cheese and red pepper relish, chocolate brownie, mini Manchester tart: He won. This was fantastic! Nothing was gimmicky and everything delicious. The portions were man sized too, with the fish and chips element being as large as some lunch options. 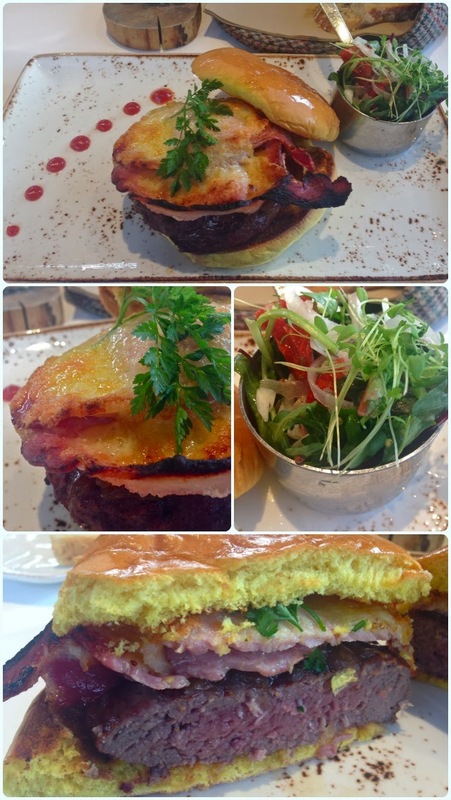 Highlights included the mini burger and that fantastic red pepper relish. 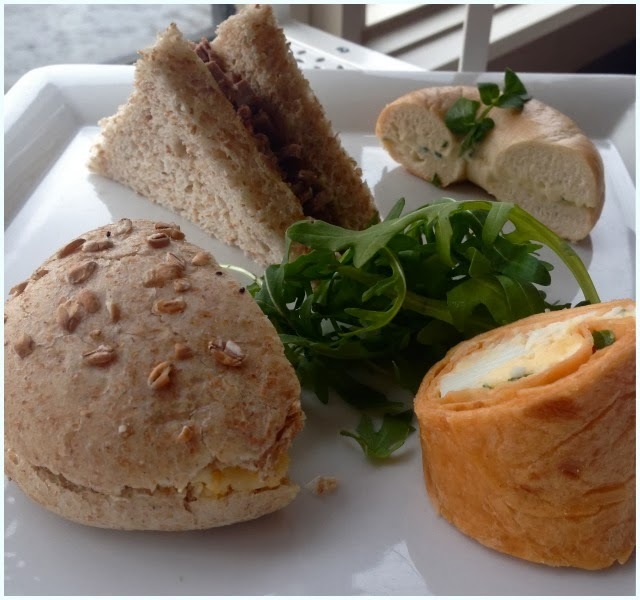 Afternoon tea - selection of open sandwiches, wraps and bagels, homemade scones with clotted cream and jam, Eton mess, chocolate mousse, salted caramel macaroon, Victoria sponge: Nice touch with the variation of bread items, but the cakes stole the show. I cannot fault a thing. I could have eaten a full portion of that Eton mess, and the mini Victoria sponge was as light as a feather. At £16.95 we both felt that either option was an absolute bargain. Everything is made in house from scratch, and the service we received was friendly yet professional. 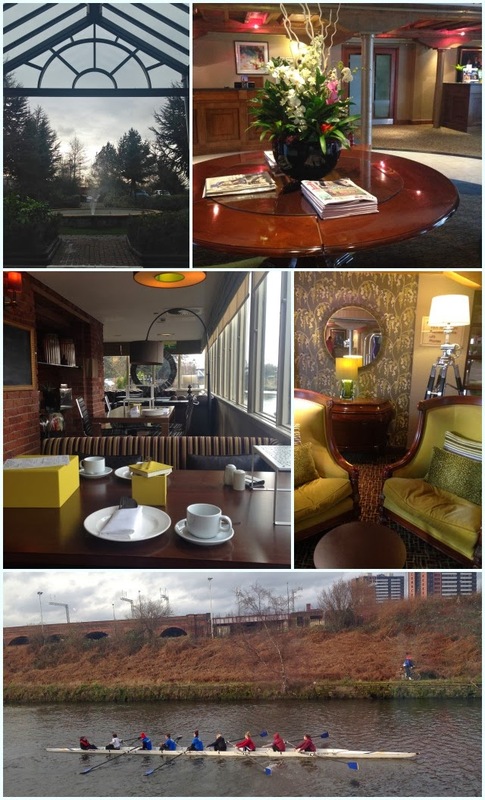 We'll definitely be back to the Victoria and Albert Marriott. I know just before Christmas they were doing a special festive afternoon tea, so I'm interested in any other seasonal variations they may be offering. What a luxury. I booked a random Friday off work, and decided to make the most of it by taking my mum on a little trip to York. The weather was forecast to be dull with the odd shower, but instead we were treated to lots of Yorkshire sunshine. In your face Met Office. 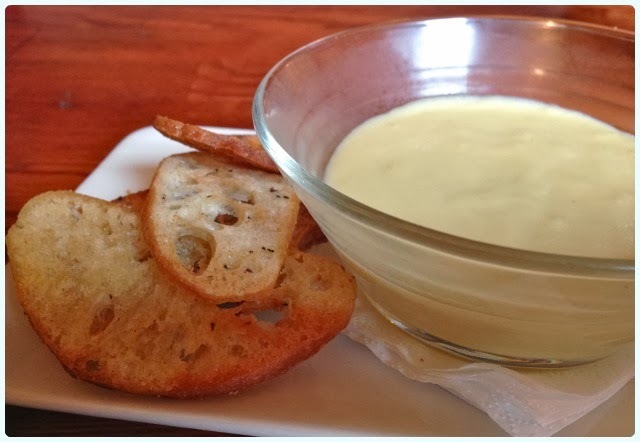 A few years ago, my husband and I made the mammoth trip to Harome to sample the wares of the Star Inn. A short drive from Helmsley, it feels like travelling to Lands End, as half of the drive is on little A roads peppered with assorted wild fowl who like to run out into the road without a moment's notice... Despite the epic journey, we ventured back for our first wedding anniversary, and declared the place wonderful. Fast forward a couple of years. 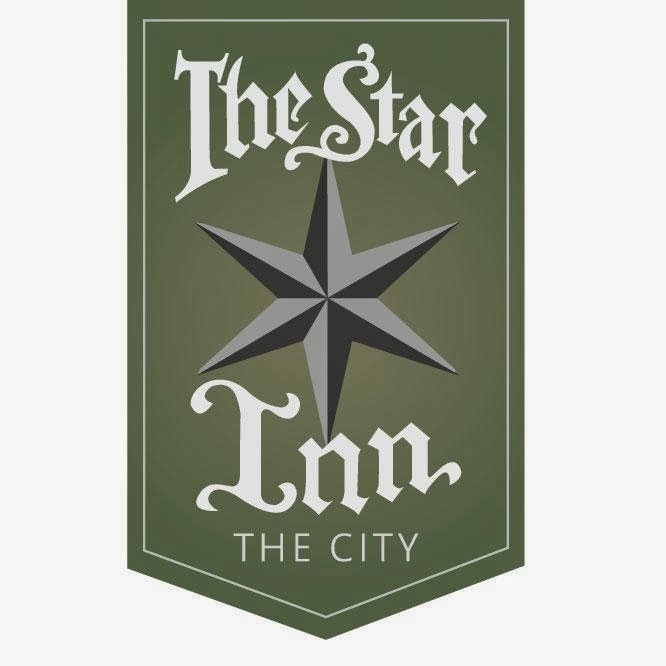 I heard rumblings that Andrew Pern was to open a city centre sister to the Star Inn, cleverly named the Star Inn the City. It's a far cry from the 14th century thatch of Harome - this new venue looks ultra modern from the outside, whilst remaining sympathetic to its beautiful riverside surroundings. The large glass walls allow the light to flood in, and treat diners to excellent views over the park. The dining room echos the soft furnishings of the Star Inn and that of their sister hotel in Harome, The Pheasant. Soft tartans are complimented by pretty floral lampshades, and calamondins sprout between the table divides. If you look carefully, you'll see an abundance of wildlife in the museum gardens, including the odd red squirrel! 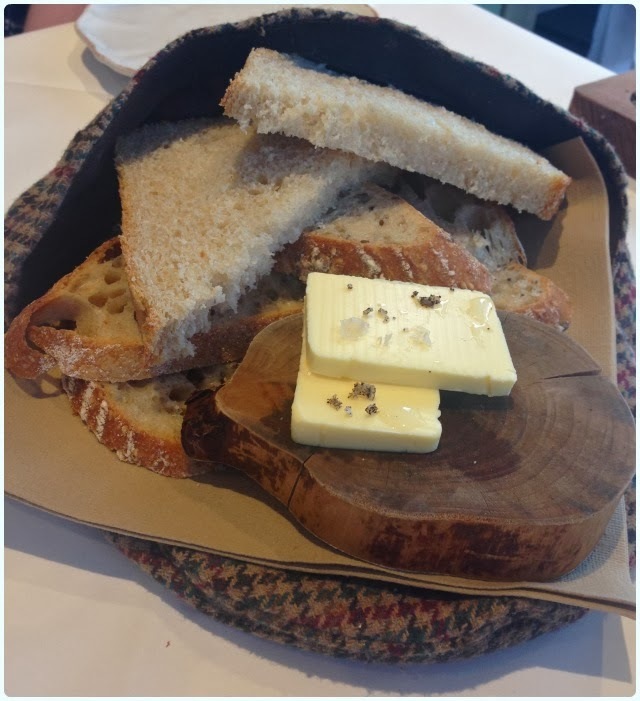 We thought starters may be a little too much (we were planning a mid afternoon trip to Betty's), but neither of us could resist some home made bread. This comes served in a flat cap! Whilst my mum enjoyed a crisp rosé, I couldn't resist a rhubarb and custard milkshake! 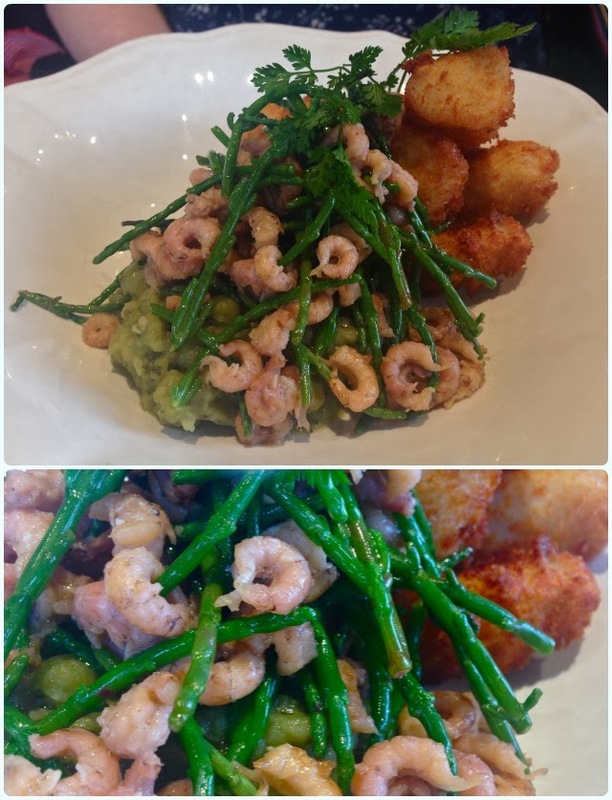 Deep-fried Breaded Scarborough Woof with Marsh Samphire, North Sea Brown Shrimps & ‘Yorkshire Caviar’: This was my mum's choice. After much giggling about 'woof' she concluded that it was absolutely delicious. Burger, Yorkshire Cheese, Smoked Bacon & Onion Marmalade: Designed for the hungry, this is a densely meaty burger served with perfectly melted cheese and charred bacon. 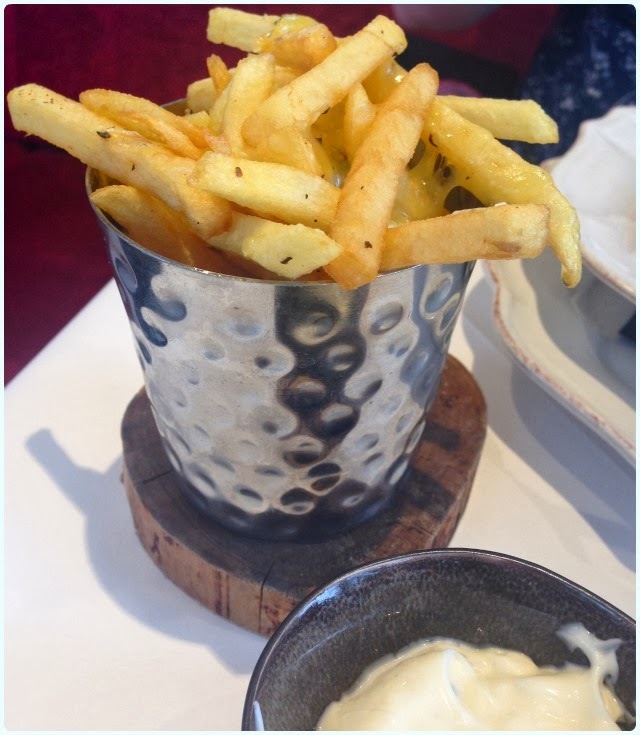 Skinny Frites with Trufﬂe Mayonnaise & Moorland ‘Tomme’: A little too truffly for me, but nice crispy chips with plenty of cheese. First Season's Rhubarb Dessert Platter: This is one of the best desserts I have ever eaten, and you know I've eaten a lot. This was a sharing platter for two, but we struggled to finish it between us! 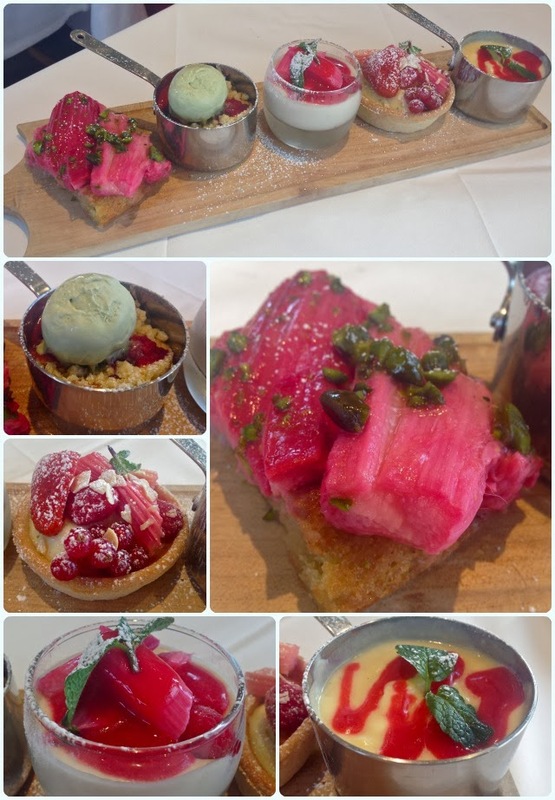 Each item was generous, but was aided further by the sumptuous mix of rhubarb, custard and pistachio; each dish a variation on the same theme. I can't wait to go back here with my husband. 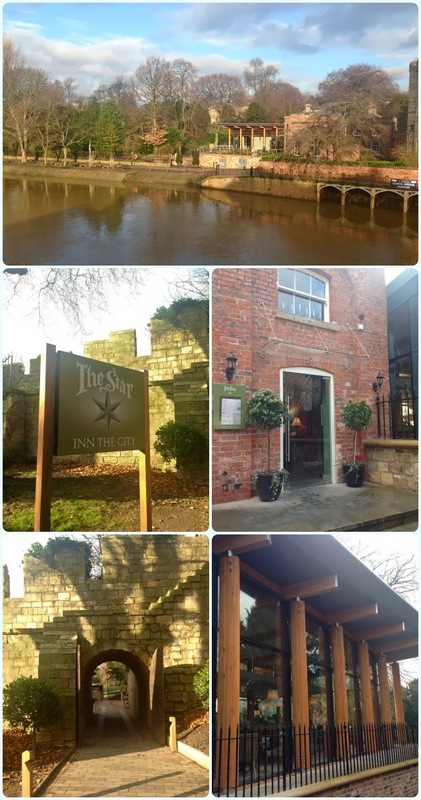 The Star Inn the City are serving some tasty English classics, with a cheeky Yorkshire twist. 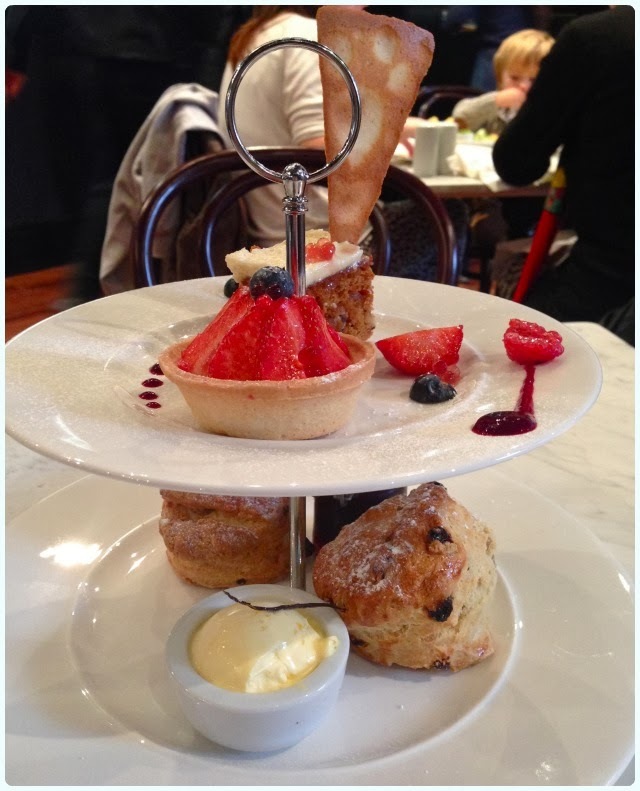 We were so full we only managed half a scone each at Betty's before calling it a day! This is the perfect place to sit and relax whilst enjoying some rather wonderful food. !Ay ay ay¡ This cake is literally hot stuff! 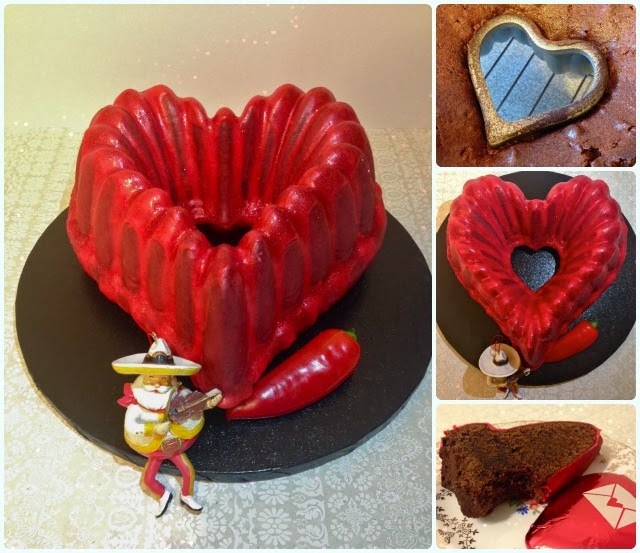 Last year I made a sophisticated Prosecco Bubbly Bundt Cake to celebrate Cupid's favourite day of the year, so naturally had to restore the balance with something a little bit wild this year. 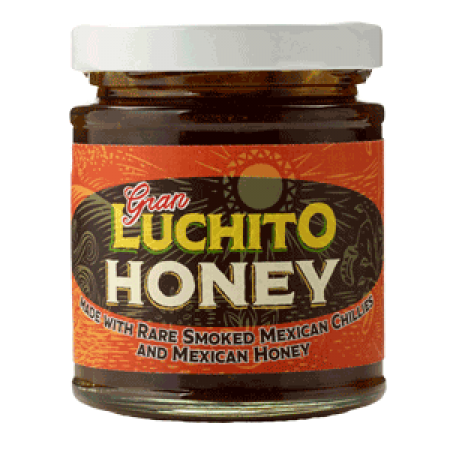 Inspiration came from my recent trip to Wahaca in London, and some delicious chilli infused honey that I was sent by Gran Luchito. Mexicans take something as wonderful chocolate and give it some special kind of treatment. They infuse their hot chocolate with cinnamon and chilli to make a sweet yet lively morning drink. I knew honey would be the perfect vessel for for adding chilli to a cake, as it was still quite sweet. This version is mildly smoked and packs quite a punch, so very little goes a long way. If you're a little worried about adding something spicy to a cake - relax... My friend Claire was literally fuming with me when I appeared with this cheeky number this morning, only to be won round by its sultry charm. This tastes very much like a fudgy chocolate cake, with after-notes of cinnamon and a big kiss of warmth on your lips. Soften the butter and cream in the sugar until pale. Add the eggs one at a time on a low speed. There's a lot of egg here so do it nice and slowly. Add all the other dry ingredients to a separate large bowl. Add the vanilla extract and honey to the milk and put to one side. Make sure the honey is properly mixed in. Sift 1/3 of the flour mix to the main mix. Fold it in gently. Add 1/2 of the milk mix to the main mix. Repeat this until everything has been incorporated. Give the whole thing a quick whizz for about 10 seconds on a low speed. Pour the mix into your tin, taking care not to neglect those nooks and crannies! Cook for an hour and a half on Gas 3/160 C, turning after an hour. Leave it to cool for 10 minutes then take the cake out of the tin. It's fairly robust this one! Allow the cake to cool fully. This is the perfect cake to share with your loved one, your friends or indeed all by yourself. 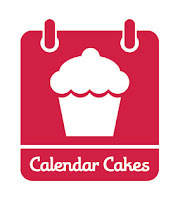 Firstly, apologies for the absence of the Calendar Cakes Challenge so far this month. Laura has decided to take a wee blogging sabbatical, and I have had to take a little time off too. Anyway, enough of the excuses, here I am with your new challenge! Whatever makes you crack a smile! 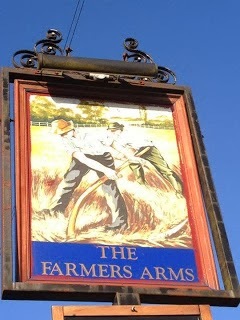 I've been a fan of The Farmer's Arms since our first visit back in August. Jon and his team have recently closed for a couple of weeks to complete a bit of a 'wash and brush up' of the place, and reopened with a new menu, including more burgers and even some hot dogs. The Bolton News recently asked whether the town is ready for such items... erm... yes! Why wouldn't we be? Scores of us jump on a train and travel to neighbouring Manchester for such goodies, so it's great for the town that we have something like this a little closer to home. After all, chef and proprietor Jon Jones has worked for the city based behemoths Solita and Home Sweet Home (spawn of burger kings Almost Famous), so knows what the punters want. We popped over for lunch today to show our support for Jon, but also to investigate the new menu! Fish and Chips: Dad fodder. This fish was huge, so much so he couldn't manage a dessert. This is unheard of. 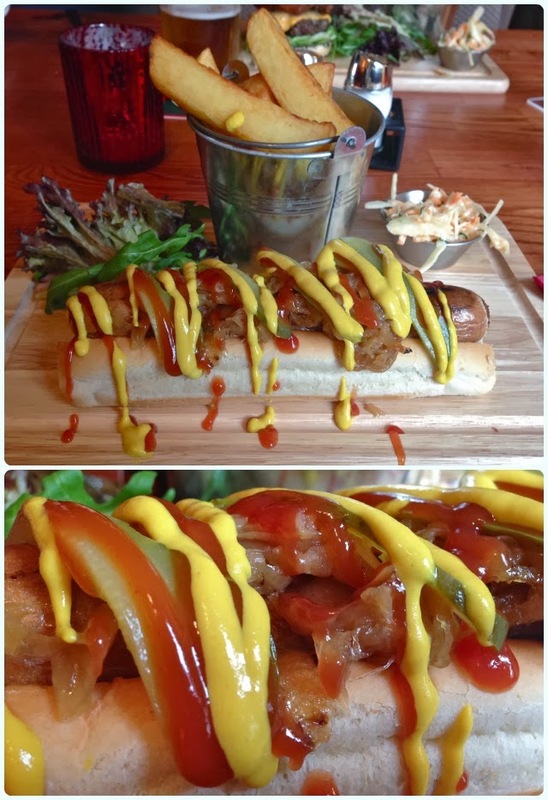 Bull Dog: Pork hotdog on sub roll with caramelised onions, pickles, mustard and ketchup. A proper banger rather than those untrustworthy sorts made of all manner of leftover pig and god knows what. Believe it or not, this was my mum's choice! She liked the idea that a donation from each sold went to help our local wheelchair basketball team, the Bolton Bulls - thus the catchy name! Another enjoyable meal at the Farmer's Arms. 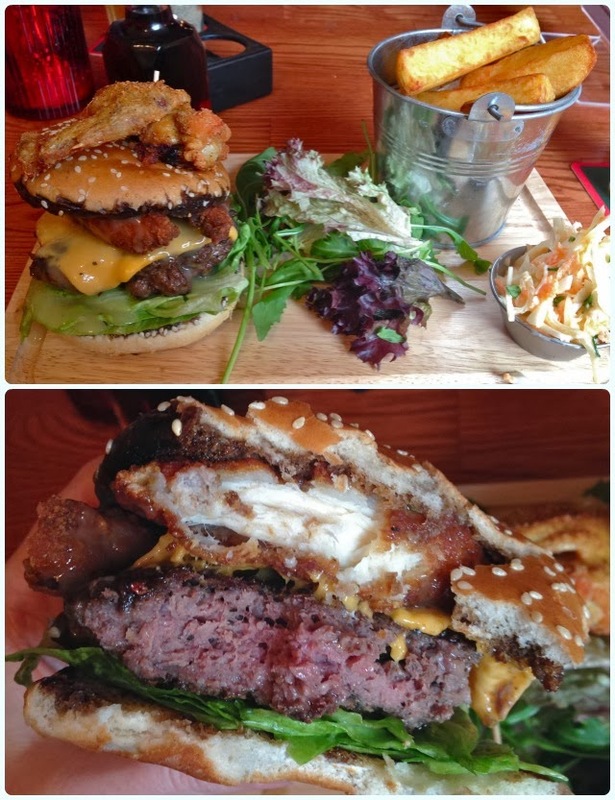 My mum has already pencilled in another trip to try more of their delicious new menu! 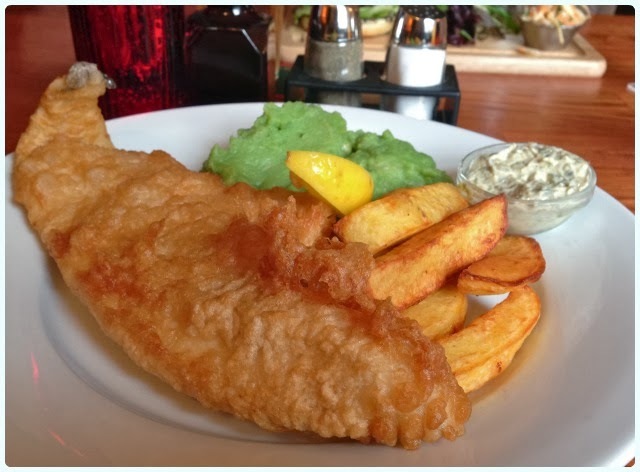 If you're looking for a more in depth review of the Farmer's Arms, please click on the link at the top of this post. Anyway, I digress. The lovely folk of Twitter had recommended a funny little gaff by the name of Trembling Madness. Named after the inevitable side effect of fervent drinking, this pretty place is situated on one of York's quaint little streets and can trace its history back to 1180. 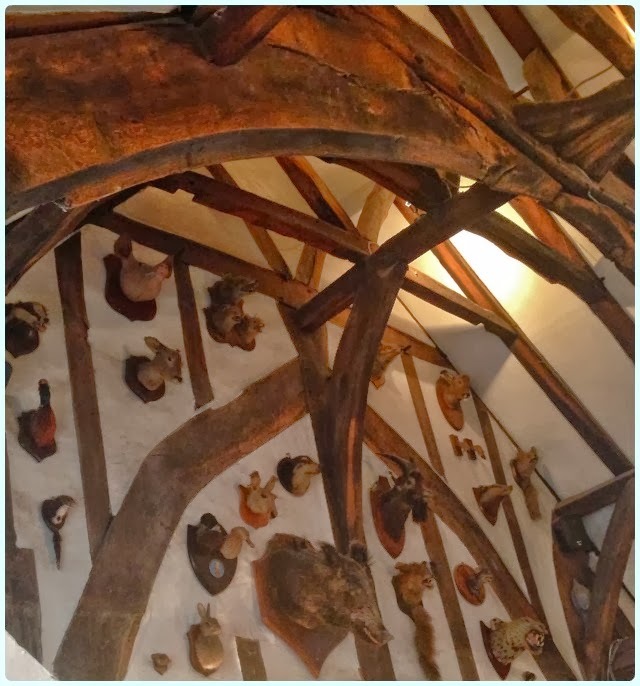 It boasts a vast bottle shop on the ground floor, a cavern-like den of spirits in the basement, and the most impressive taxidermy clad dining room upstairs. We were advised to get there early, so arrived about 5pm. There was already a 'one in one out' system in place for the dining room, but it didn't bother us in the slightest, as this meant we had ample time to peruse the well stocked shelves - all 600 bottles! We were starved after an afternoon of walking up and down the enduring rabbit warren of streets, avoiding those with large lensed cameras and pushchairs, and drinking in all sorts of higgledy piggledy places. The surrounding folk of the dining room were friendly types, who helped me to source a rather lovely table by the window. 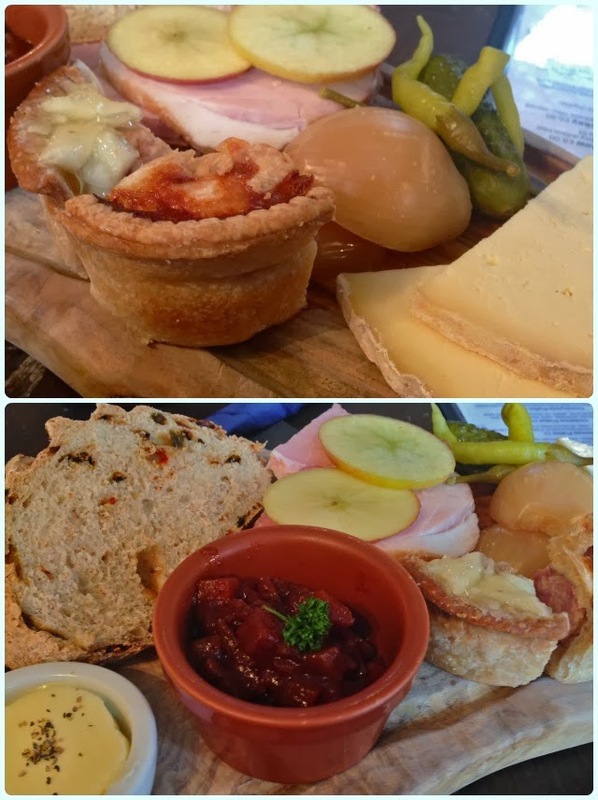 Yorkshire Platter: Two types of pork pie, pickled onions and chillies, sweet pickle, cheeses, honey roast ham, apple slices, bread and Yorkshire butter. This was utterly delicious. 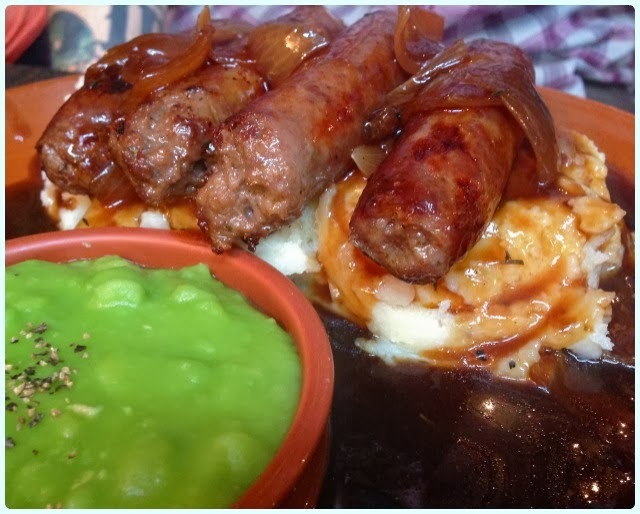 Bangers and Mash: Thick venison sausages on creamy mash with rich onion gravy and a side of mushy peas. Winner. No winter expedition to York is complete without a trip to Trembling Madness. 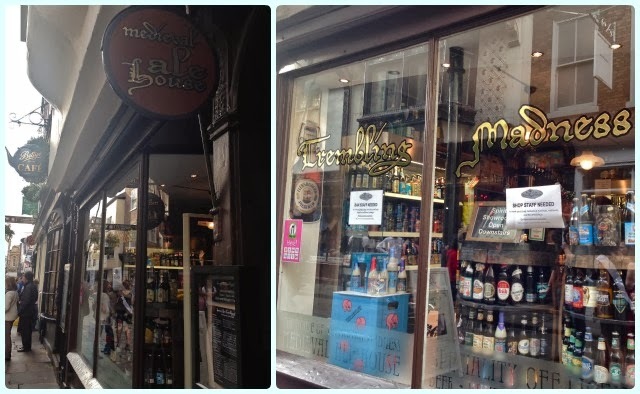 Whether you're there for the beer, food or to pick up a bit of booze to take home, it's the perfect little hidey-hole. 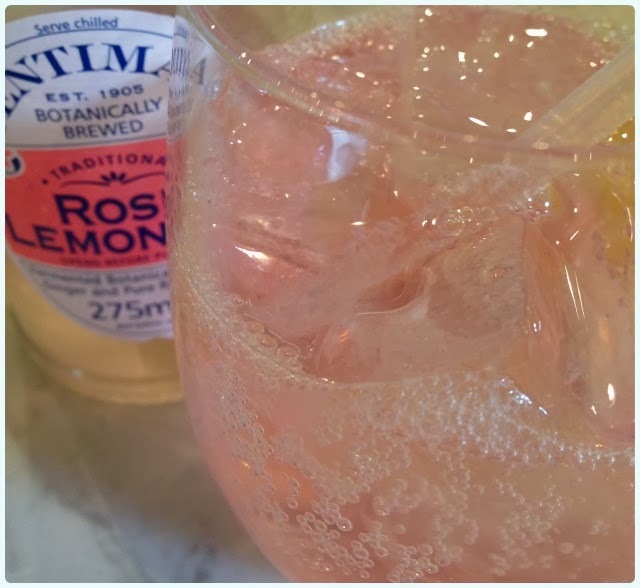 Back in October I reviewed Rosylee Tea Rooms in Manchester's Northern Quarter. This is just a quick check in to see if they were as wonderful as I had remembered. We were popping in for cake prior to a meet the brewer event at Port Street Beer House - the perfect partnership, don't you think? 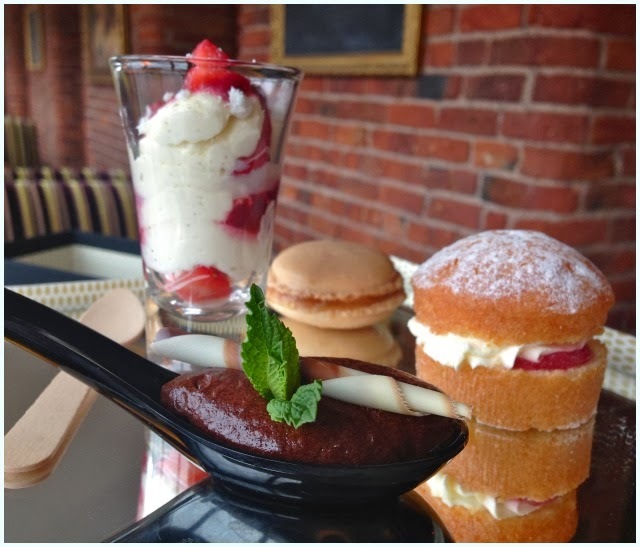 This is just a brief whistle-stop tour of the late afternoon sweet treats we enjoyed. 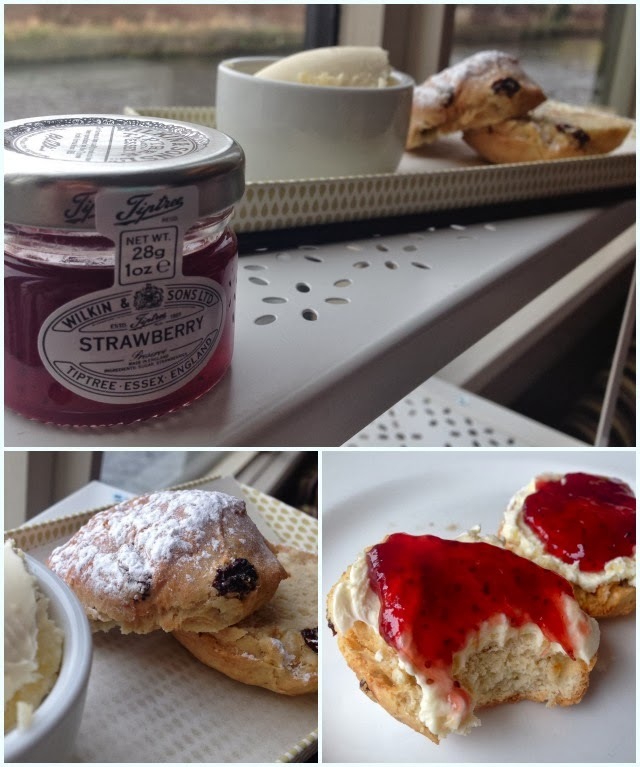 Peckishness was at fair to middling level, so we sampled a large slab of strawberry layer cake and a cream tea, which included a selection of cakes, two warm homemade scones, clotted cream and strawberry preserve with a pot of Rosylee tea. I'll stop gassing as I promised it would be brief. For a more in depth review, please click on the link at the start of this post. 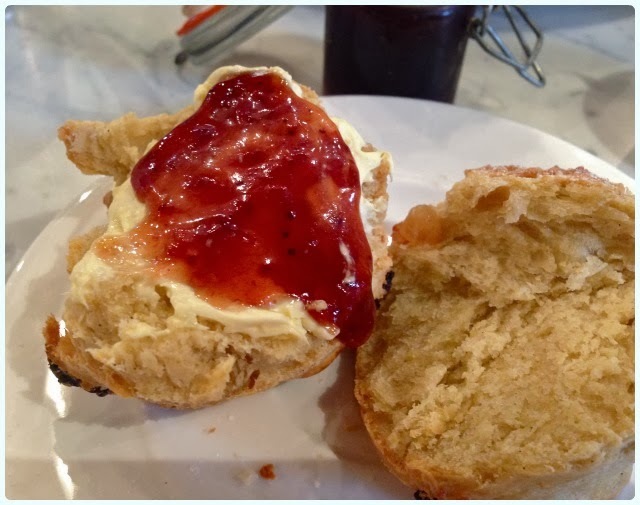 Scones: The reason I picked cream tea. Just as wonderful as last time. 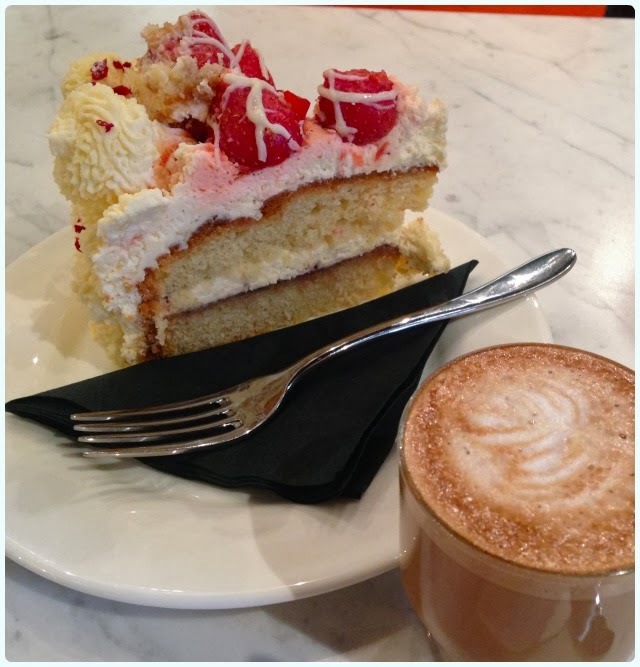 Strawberry Layer Cake: Covered in real fresh cream rather than sickly buttercream. Absolutely delicious. A delectable little trip to Rosylee once again. 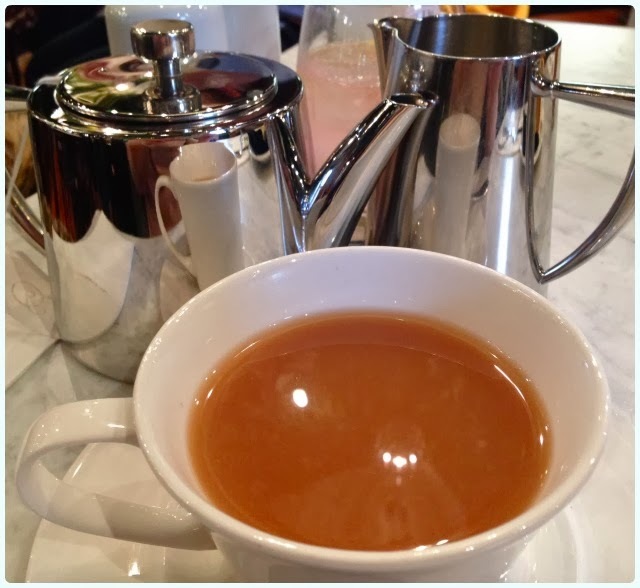 Click here for more Tea Room reviews.